The word Kathiawad means the land of the Kathis, a Rajput tribe of Scythian or Indo-Getic origin who migrated to the region in the 8th century and controlled the southwestern peninsula of contemporary Gujarat. Kathis were widespread in the region and dominated central Saurashtra in particular for some centuries. Although the Kathis are believed to have migrated to the area as late as the 16th century, they have played an important part in the documented history of the region. During the reign of India Pratihar ruler Mihir Bhoj, the Gurjar empire stetched from Kathiawad to the Bay of Bengal. A Haddola inscription confirms that Gurjar Pratihars continued to rule in this region during the reign of Mahipala I too. The peninsula is dotted with antiquities and has a continuous history from prehistoric times to the early periods of the Mahabharata through the Indus civilization. It was influenced by Kathi people in particular between the 16th century to the mid 20th century and therefore the emergent name of Kathiawar became a favourite alternative to the region of Saurashtra. 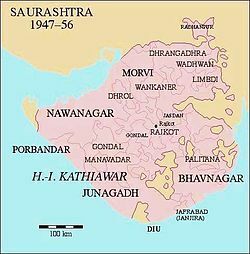 ^ "Gujarat Map". mapsofindia.com. Retrieved 2016-03-21. ^ a b "Asiatic Lion population up from 411 to 523 in five years". Desh Gujarat. 2015-05-10. Retrieved 2016-11-26.